Sign Of The Times: Labor Strikes May Make A Comeback Once a mainstay of the labor arsenal, strikes have largely fallen off since the early 1980s. So a recent spate of high-profile disruptions has labor experts wondering if we're seeing a resurgence. They say worker frustrations over stagnant wages and reduced benefits may have finally hit a tipping point. 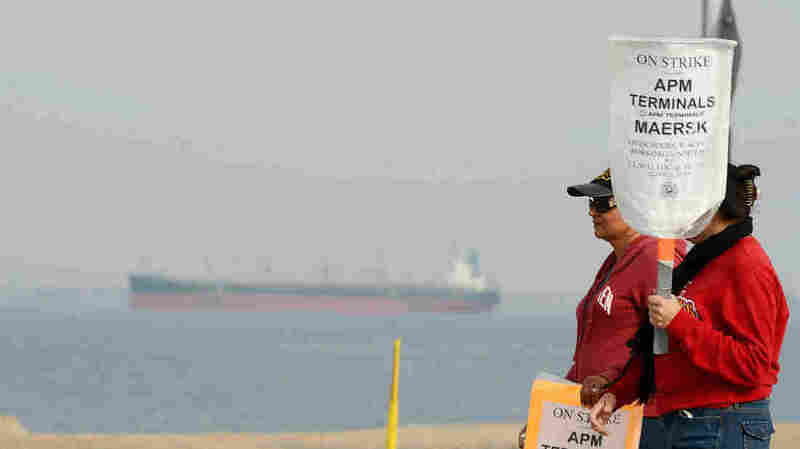 When clerical workers at the ports of Los Angeles and Long Beach reached an impasse in talks with management over job security last week, they took what has become something of a rare step: They went on strike. Once a mainstay of the labor arsenal, strikes have largely fallen off since the early 1980s. So a recent spate of high-profile work stoppages, including by Chicago teachers, nonunionized Wal-Mart workers and New York City fast-food employees, has some experts wondering if we're seeing a resurgence of the tactic. Thomas Kochan, co-director of the Sloan Institute for Work and Employment Research at the Massachusetts Institute of Technology, thinks years of pent-up frustration over stagnant wages and diminishing benefits has finally hit the boiling point. Work stoppages have fallen off precipitously since the early 1980s, according to data from the Department of Labor's Bureau of Labor Statistics. Number (in thousands) of workers involved in those stoppages. "If you look at the national data, you see a decline in job satisfaction and you see tremendous frustration, particularly among younger workers who recognize they can't get the kinds of jobs they've been educated for, that they can't support their families or earn the kinds of incomes that their parents earned at comparable stages in life," he says. It's been years in the making and long held in check by higher unemployment, but "you're going to see more of those pressures explode in different ways because the economy is getting better, but people don't necessarily feel it," Kochan says. Labor lawyer and author Thomas Geoghegan agrees things may have reached a tipping point. He credits the Occupy Wall Street movement with reminding labor "that getting out in the streets and making a loud noise is an option." "There are people who aren't ready to strike now, but they are paying close attention to see if this sort of thing works," he says. "If it does, you're going to see more of it." Case in point: the Black Friday protests at Wal-Mart, which is known for its strong opposition to labor. Scores of employees at stores across the country, joined by an even greater number of activists, staged a one-day walkout on the big shopping day after Thanksgiving over what they see as low pay, lack of benefits and heavy-handed corporate tactics to prevent them from organizing. The retailer tried to prevent the union-backed demonstrations but failed. The Wal-Mart protests were an inspiration to many who manned the picket lines in Los Angeles and Long Beach, says Craig Merrilees, a spokesman for the International Longshore and Warehouse Union, the union that represents the striking port workers. "It got so much media coverage and involved such a high-profile employer that it's hard to ignore them," he says. But with U.S. unemployment at 7.7 percent and concerns about corporate outsourcing — not to mention Wisconsin's move against collective bargaining for most public employees, and Michigan lawmakers passing "right to work" legislation that would make paying union dues voluntary -- is now the time for workers to walk off the job? Chris Edwards, the director of tax policy studies at the libertarian-leaning Cato Institute, says no. The hypercompetitive economy makes it nearly impossible in the long run to squeeze employers, he says, adding, "If you raise worker pay, it's just going to mean fewer jobs and benefits and more automation down the road." Over the same period, corporate profits have mostly risen even as inflation-adjusted wages have remained stagnant, according to Thomas Kochan of MIT's Sloan Institute for Work and Employment Research. And Edwards notes that even a handful of workers can wreak havoc: "It was a small group of clerical workers at the port of Los Angeles that cost billions of dollars in trade disruption." MIT's Kochan acknowledges that to strike is always a dangerous gamble. "That's nothing new," he says, "but the fact that there are fewer jobs out there makes it more risky, to be sure." He cites a weakening of penalties and enforcement mechanisms that protect workers since the 1980s as a primary reason why strikes and other labor actions are more perilous now than in the past. It's a theme echoed by the chief of staff at the country's largest labor organization. Jon Hiatt of the AFL-CIO says President Reagan's firing of 13,000 strikers belonging to the Professional Air Traffic Controllers Organization in 1981 was a watershed event in labor relations. The air-traffic controllers were in violation of federal law that banned strikes by government workers. "I think PATCO was certainly an important event because it represented the de-stigmatization of anti-union activity in a really extreme way," Hiatt says. What followed was an erosion of labor protections during the Reagan administration. At the same time, there was an enormous outsourcing of jobs and technological advances that "changed the whole nature of the workplace and made strikes a less effective tool," he says. But Hiatt feels a change in the winds. "There are more and more signs of workers looking for some sort of coming together to improve conditions," he says. "Even a few months ago, the notion that we would see [labor protests] in 100 Wal-Mart stores on a given day was hard to imagine." An earlier version of this story stated that thousands of Wal-Mart employees took part in the Black Friday protests. Wal-Mart says 100 workers participated, while one of the protest organizers, OUR Walmart, says 500 workers and thousands of activists were involved.